I love it when I run across unsolicited exclamations of crowdsourcing success. 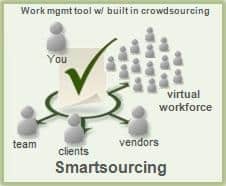 Particularly when they are due to Smartsourcing. I was reviewing the Tweets on our recent Guest Post on Smartsheet’s success in the Google Apps Marketplace and, wham, there was my new favorite person Michael J. Evans. Michael apparently used our paid crowdsourcing feature to get feedback on videos. Well done sir. 11:07 Completed two instructional videos and free live demo. 11:11 Signed up for cheapest plan, $9.95 for one month of access. 11:16 Googled "Fortune 500." Copied the first 50 into Smartsheet. 11:24 Manually identified 4 general counsels to guide writing instructions. 11:32 Composed instructions, launched job, and received email confirmation. Roughly 1 hour stem to stern, and Philip had successfully tapped into the hundreds of thousands of always ready internet workers. Now, I don’t know how many individual workers actually completed his crowdsourcing job, but if it was statistically average, it was about 20, of which 2 did 40% of the work. The team here at Smartsheet love customers like Philip. Switched on, and appreciative of the thought that went into making an emerging category called crowdsourcing ‘over the counter’.